Yahoo Video Guide is a modern-day TV Guide for finding what to watch and where to find it across a variety of services. Yahoo’s new iOS app will have viewers spending less time searching through streaming apps to find something to watch, and more time actually watching. The Yahoo Video Guide app is a one-stop-shop for finding movies and TV shows that are streaming on over 30 services. With Yahoo Video Guide, you can search for movies and TV shows to stream on Netflix, Hulu, HBO, Amazon Instant Video, Showtime, YouTube, Xfinity and other channel apps, as well as rent or purchase movies and TV episodes from services like iTunes, Amazon, and the Google Play Store. 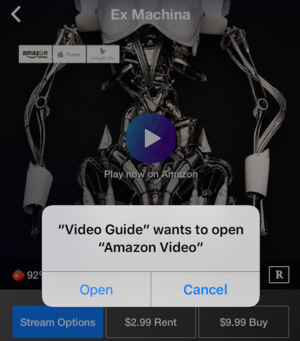 If you have the streaming app installed, the Yahoo Video Guide will open it to the specific app movie or episode. If not, it will redirect you to download it from the App Store. For iOS users with multiple streaming subscriptions, Yahoo Video Guide is the ultimate timesaver. It took less than 30 seconds to discover that the first Hobbit film is available to stream on the TBS app, that we can rent the sequel on Amazon or iTunes, and that the third and final installment is currently streaming on HBO Go. We just had to search for “Hobbit” once, instead of conducting that same search back-and-forth on different apps. The impact on you: Yahoo Video Guide is very similar to Can I Stream It? but Yahoo’s version is all free. There are mobile banners on the free version of Can I Stream It?, and you have to pay $1.99 for the Pro version that lets you search through just the services you subscribe to. Being able to search through your services is actually a key feature in Yahoo Video Guide. 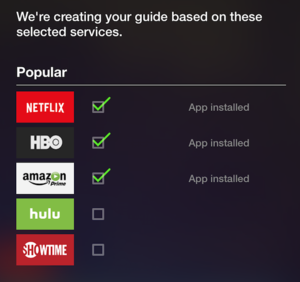 The app creates a personalized guide by finding the streaming apps that you’ve installed on your iPhone. You also have the option to add more services, just in case you have a subscription but for some reason haven’t installed the iOS app.